What is LCA for H1B Visa and Why LCA is Required to File H1B? Where does one find the prevailing wage information? How Employers File LCA for H1B? You must have heard from your employer about LCA for H1B Visa. 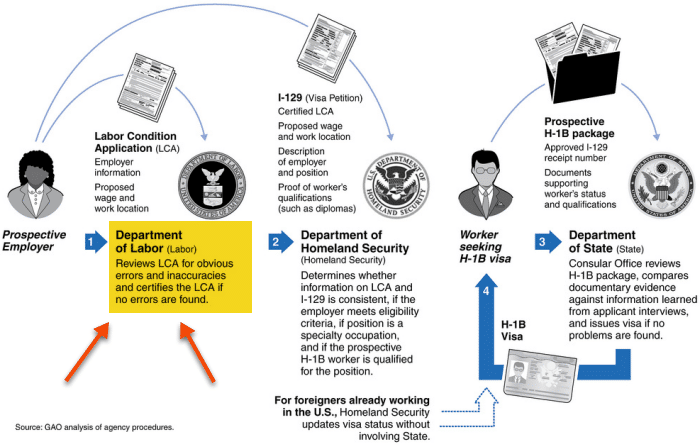 Look this the following H1B Visa Application process flowchart, the first step is Labor Condition Application (LCA). H1B Visa application (New, Extension or Transfer) cannot be filed with USCIS without an Approved LCA from the Department of Labor. H1B Visa 2018 season is coming up shortly. Employers will be applying for LCA anytime between February to March for the season that starts in the month of April to get their application ready to file this April. Attorney Murali Bashyam answers the above questions about LCA for H1B Visa in this video. Raghuram Sukumar: Okay. If I’m trying to file an H1B on March 31st, what should the employer’s case preparation time-wise look like? Murali Bashyam: Employers really need to keep that timeline as far as what it takes to prepare an H1B case in mind actually, because we have employers asking us all the time, “We know you have to file the case on March 31st for April 1st receipt, but how late can we get a case to you?” Let me kind of go to the timeframe. Let’s say you’re an employer who has never filed an H1B before, then you got to actually submit your federal implement identification number information to the department of labor first for verification. That’s what a lot of employers forget because they think it starts with the LCA process. That’s true if you’ve already done h1s in the past. That verification process for companies who’ve never done H1Bs before takes about five days for the department of labor to verify the LCI and get that information back to you. Only after that is verified can an employer actually file a labor-condition application or LCA as it’s commonly known. Now, if you’re an employer who’s already filed an H1B in the last four to five years, then you don’t have to go through that first step. You can file an LCA directly with the department of labor as the first step. Right now, that takes about five to seven business days for them to certify that LCA. Once the LCA is certified, then you can actually file the H1B application with the immigration service obviously for April 1st filing. The total timeframe before you can even file an H1B, if you’re an employer who has never done one before, you’re looking at 10 to 12 days with DLL verification and LCA filing and everything else. If you’re an employer who’s already done H1Bs before, about five to seven days before an H1B can be filed. Of course, giving your attorney or law firm some time to prepare the case as well, a lot of work goes into it, but that’s the timeframe employers should keep in mind. Raghuram Sukumar: Okay. Which means, obviously, they’re looking at, if it’s a new employer, they should come to you or an attorney before March 15th to give enough time for them to look at the applications? Murali Bashyam: I would say at least… Yes, definitely by March 15th if you’re an employer who’s never done an H1B for a worker in the recent years. If you’re an employer who has done an H1B in the last four or five years, then maybe March 20th at the very latest. Right around there, but again, you don’t want to wait until the last second. Sometimes, the department of labor with the LCA system because there’s going to be high volume, they might take longer than seven days to certify an LCA. Things do breakdown on the government’s side, so you don’t want to chance those types of things. The earlier you get your case, prepared, filed, and ready for April 1st, the better off you will be. Raghuram Sukumar: What is LCA for H1B Visa? Murali Bashyam: An LCA is a labor-condition application, and that is filed with the department of labor. That’s where the employer will set the prevailing wage for the position, and that’s where the employer certifying for the department of labor that they’re actually offering a wage to the H1B worker that is at least the prevailing wage or higher. The employer’s obligation is to offer at least the actual wage or the prevailing wage, whichever one is higher, to the H1B employee. The LCA is the manner in which the employer prepares and certifies that with the department of labor. Raghuram Sukumar: Where does an employer figure out that… Where do they find out the prevailing wage information? Murali Bashyam: Prevailing wage information, there are two ways of figuring that out. You could either file an application with the department of labor. The department of labor also has other resources online where the employee can look up prevailing wages for various positions. Prevailing wage is really determined by, number one, what’s the job. Number two, where’s the job located, which county, what city, what state. Number three, is it an entry-level position or is it a non-entry level position. The employer or the attorney will have to figure all of those things out, determine what the prevailing wage is and the offered wage has to be at least that wage or higher. Yeah.. H1B and GC can go on in parallel. If passport is in renewal state then can employee file h1b petition using current passport no and later once have new passport no , he can update the details. Can LCA apply while candidate passport is renewal state? Employee is asking for passport details and employee passport is in renewal state. Can he provide the current passport for LCA and once passport will renew he will provide the new passport no? Can H1B process filled with passport while it’s in renewal state? Can an employer file for an H1B without making an offer to the potential employee? Or should there be a signed offer in place? Typicality there will be a signed offer. Fantastic post and it’s really helping me to understand how the whole H1B process works. Once again Kudos to you and Murali Bashyam for detailing and nailing down each queries. However, is there a chance where you could let us know how to “submit your federal implement identification number information to the department of labor first for verification”. I mean what are the items which needs to share it with DOL and where and how to send this ? And I believe it should be Federal Employer Identification Number (FEIN) and not Federal Implement Identification Number. Correct me if I am wrong. I don’t know how that process woks and I don’t think you have to worry about that. Just hire an Attorney. Should we have to sign LCA? Also, how do we know if my employer really filled my H1B application? Not for H1. You have to trust your employer, if not find a new one. Now I have doubt on whether the employer really files my h1b or not, how to know the status of my filed h1b. Also till now I haven’t got any documents from them for signing. Will it be possible for my prospective employer to file an H1B now and successfully apply before april 1st? What are the steps for getting Federal Implement Identification Number verified by Department of Labor? I am on H1B Visa with Company A and got another offer with company B. They are filling my H1B Transfer and said that i will be able to work after they get their receipt of H1B Transfer. They will be filling my H1B transfer on 21st July 2014 and saying that they will receive the receipts by 1st August. No assuming that they have offered me the start date of 4th August 2014. If i give notice to leave the company A after 2 weeks my end date with current company will be 25th July 2014 and my start date with the company B is 4th August 2014. I want to give notice to my current company soon because i need one week for moving as my new company is 1300 miles away. So My question is the period between 26th July to 3rd August I will not be on anyone’s payroll, no company. Will it be problematic for my status? Also please suggest any solution if any ?? I have a question , please do reply . There is a name mismatch on my passport and on degree certificates and my experience letter. Name on passport : Raghavendra kumar Raipur. please advise me , if this is adding any complexity for applying H1B ..? Thanks in advance for your time and trouble taken. Let me know the No of H1B VISA to be allowed for the year starting from 1st April, 2014. Premium VISA applicant have any chance for the general category? when is the LCA generally filed for a new H1b, i have been approached by a consultant/employer and they are telling in month of OCT only they will file the LCA, is it, but as per your above description it seems it generally starts much later. I’m not clear with your question. For new H1B, LCA will be typiclaly filed like 10 to 15 days before actual H1B application. Read others comments. Employees shouldn’t pay for H1.